NOW OPEN: Jump Inc Lincoln is, quite possibly, be the best trampolining park on the planet! Are you looking for fun? Are you looking for excitement? Are you looking for a new way to exercise? Or are you simply looking for something to keep the kids occupied on a rainy afternoon? Whatever you want – whatever you need – you’ve just found it. Jump Inc Lincoln is the ultimate high-octane excitement park, so leave your inhibitions and the door and get your jump on! 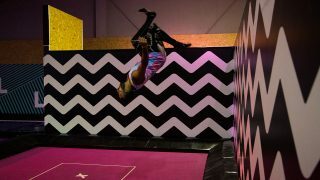 Situated in a prime location, Lincoln Jump Inc Lincoln is an easy-to-access urban playground, with high-flying excitement for all aspiring trampolinists and thrill-seekers. For the first time ever, we’ve combined both Jump and INCflated, to create a hybrid-mega park of inflatables and trampolines, all under one roof! Believe us, you will never have experienced this much excitement and adrenaline, ever. And as you’d expect from Jump, our newest indoor theme park is filled with all the trampolines, obstacles and activities you’ve come to expect from us, including Free Fall, Tumble Tracks, Slam Dunk Lanes, Inflatable Obstacle Courses, Wipe Out Balls, huge slides and much, much more! With over 30,000 square foot of indoor spring loaded urban park to explore, you can be sure there will be something for everyone aged 1 – 100 at our massive hybrid mega-park. We’ve got safe yet exciting fun for your little ones thanks to our dedicated Toddler Zone, where your little explorers can take on the world in a challenging yet 100% secure way. For older kids of all ages, we’ve got high-adrenaline activities galore, to keep them occupied and entertained for hours to come – and wear them out in the process! Whether you’ve got a family group of children or a stag party of bigger kids to keep busy, this is the place you can do it – and have fun at the same time. And whether you just want to jump around or want to try something more adventurous (Ninja obstacle course anyone? ), you can be sure that everyone will be safe and sound thanks to soft landings and secured, enclosed surroundings. Whatever your age and whatever you’re coming for, leave your hang-ups at the door and bring your courage, because you’re about to enter a whole new world of airborne fun. Prepare to be amazed! Alternatively, you can sign up to our email newsletter, to keep up-to-date on all the latest Lincoln Jump Inc news! Carers of disabled children or adults is complimentary. Please note that we have limited access for disabled use, there is entry to the inflatables from ground level however, access to the trampolines is via stairs. Carers and friends or family of the disabled are free to bring their own mobile ramp or hoist / disability equipment but must use and operate this at their own will / risk of injury, please inform us of this before you arrive so that we can arrange this for you.